The result of a project by dental students at Plymouth University has been shared nationally across the Family Nurse Partnership Programme. 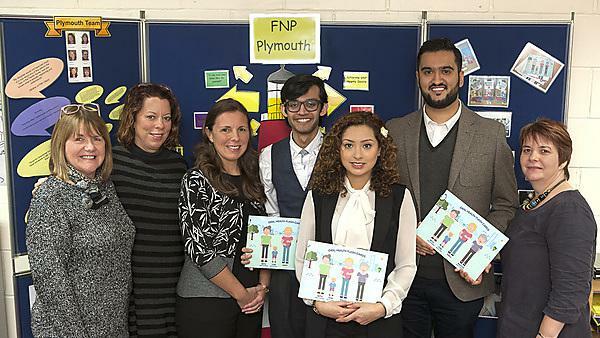 A group of dental students undertook a community project with the Family Nurse Partnership Programme in Plymouth last year. The project was part of the Inter Professional Engagement (IPE) programme which sees dental students undertake a number of projects in the community designed to raise oral health awareness and to improve access to dental care. The programme is delivered by the Community Engagement Team at the Peninsula Dental Social Enterprise. Nurses from the Family Nurse Partnership Programme at Plymouth Community Healthcare, who provide support and advice to young mothers, received training and an information pack on the care of milk teeth from dental students at Plymouth University. Part of the information pack included flash cards for use when visiting or interacting with Family Nurse Partnership Programme families, and it is these flash cards which have been shared nationally across all the programme.